Most of you should have already seen them and I've shared these also through TBs Facebook companion page yesterday. I'm a bit hurry but here they are anyway. 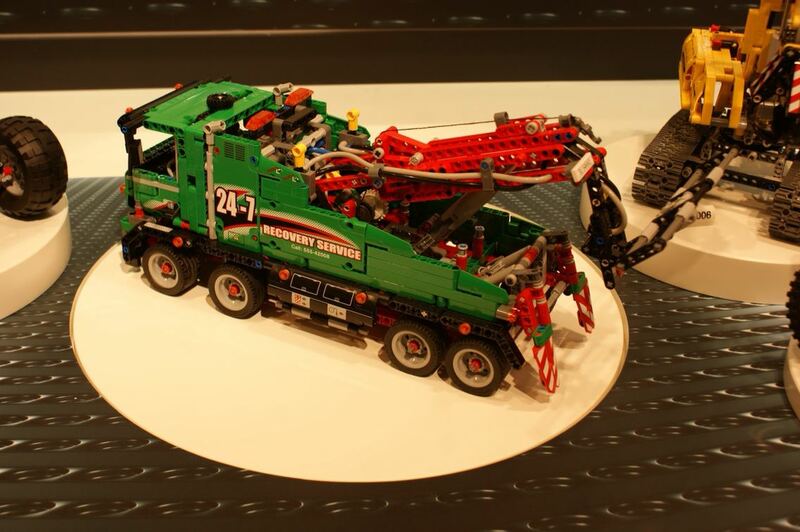 We got a great quality video from the Nuremberg ToyFair with all the 2013 LEGO Technic assortment, which reveals and explain quite a lot of details about the new 42008 Service Truck and 42009 Mobile Crane MKII. This made clear for the first time, we get 4 steered axles from the model's 5 (two in front and two in the rear). They also turn at different angles as expected, and also as Technic designers have made with previous models. It also became clear how the outriggers extend and how their feet lower or raise. In fact it seems we didn't got any new kind of extensible shaft, but likely some new 8t gears (in red) which allow a presumably 16L axle to slide in. Although i always the feeling the actual 8t gears already slide quite easier than all the others, but obviously don't slide easy enough for a smooth operation. There is also a red lever between the second and third wheels on the crane's right side that maybe used to switch between the horizontal and vertical movements of the outriggers. But this is not 100% clear neither demoed on the video. You may find additional pictures of this model at Italian Hobby Media website, which uses to bring us fresh news from the German ToyFair. Another excellent picture we got via Joe Meno, was this one from the 42008 Service Truck, plenty of details due to its relative high resolution for the usual we get (Thanks Joe!). See the the mini panels which were red and odd in the preliminary pictures you may have seen, are now also in red. Some have disgusted it or found it a bad taste, but I liked a lot this nice mix of pneumatics and large/mini Linear Actuators in one set. From the video above and sound produced, it also became clear this model got a motorized pump to feed compressed air and actuate on the rear fork. There is a plate on the crane which seem to have written something like "SU 54NN3". Can't infer who the LEGO Designer was, from this one. This model already seems really amazing for me!! SU 54NN3 = Susanne, no? The service truck is awesome! Cool parts, cool functions, cool color. Best set of the year imho. Not so sure about the crane, though. It's definitely big, but the chassis should be pretty empty. Bigger isn't always better. off topic: what about the reverse challenge? I am impressed with 42008. A lot of mixed functions with a unique coloring. It's great to add to my parts both Pneumatics and LAs. Why are they using studded beams at the end (and middle if extended)of the boom? I don't mind studded beams, but it seems unnecessary? I don't mind the green, better than all the deafault colours we usually get! I think the red sliding 8th gears will be very usefull for MOCs. Maybe the code it refers to Susanne Green (Maybe that's why it is that colour :)) , Senior Order Manager at LEGO System A/S? 42008 has two mini pneumatic cylinders - is this a first for a set? One does the fold-down of the vehicle lift. A careful look at the video reveals that the other extends the reach of the hook by sliding the 3-wide red studless beam structure on top of the 5-wide boom. The 3x5 L-beam flips over - the pneumatic cylinder pushes hole 2 of 5 with the pivot at hole 1, so there is a high gain for an extension of maybe 7-8M.